The IQ Fit is a series of colorful puzzles by Mi-Toys. 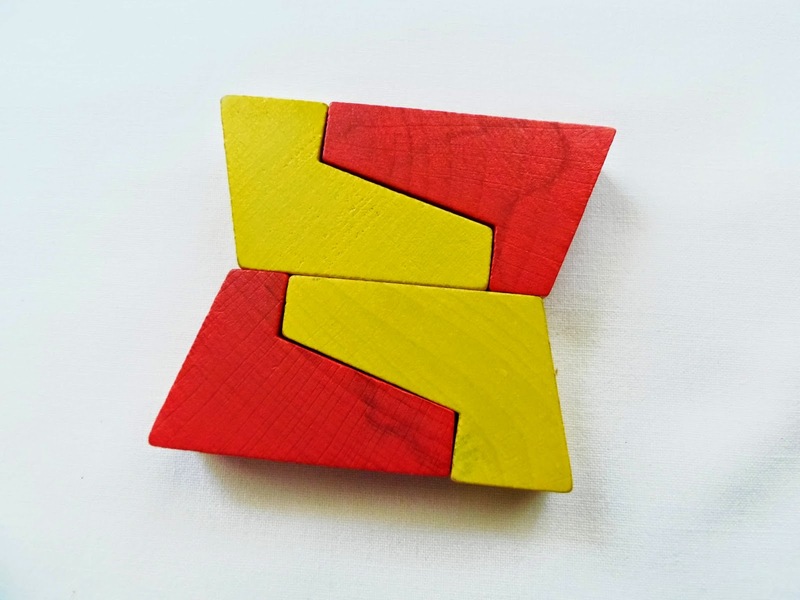 Each puzzle presents you with many challenges using different color combinations. 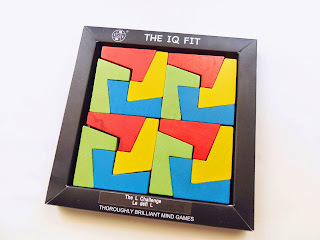 These puzzles are designed by Y. Gong, but knowing his shady practices of altering the designs of other renowned designers ever-so-slightly in order to avoid copyright violation, I wouldn't hold my breath as to the authorship of these IQ Fit puzzles as well. Maybe I'm being a little unfair, but once you go that road you can't ask for respect from the puzzle community. Design authorship apart, The L Challenge looks interesting enough, and the bright colors make it stand among other more bland colorless puzzles. The pieces are made of hardwood and painted in four different colors. The build quality is satisfying, considering its low price. 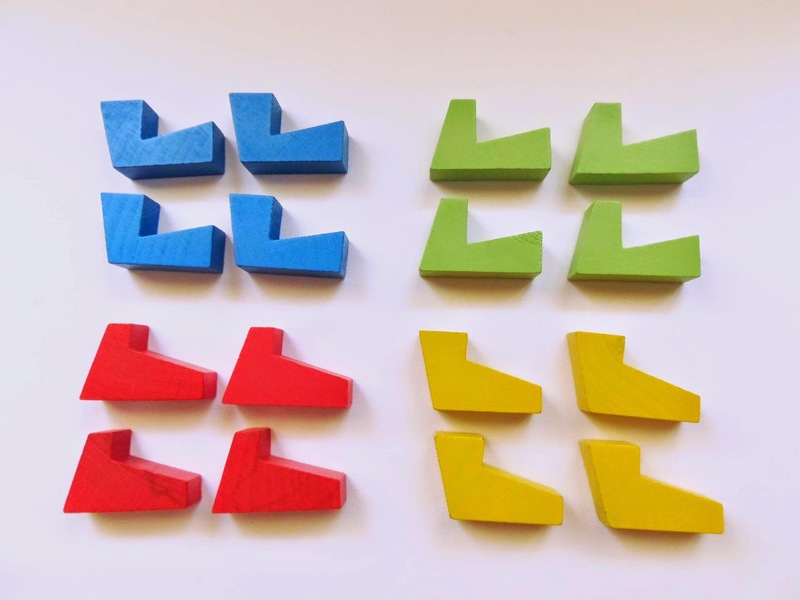 Each color represents a different shape, so you have four identical L-shaped pieces for each of the four colors (green, yellow, red, blue). The puzzle comes neatly packed in a tray, but unfortunately it's made of paper. In this case, a wooden tray would've made a bigger difference in the presentation. In the end, you have to keep the paper tray, because otherwise you don't have anything to keep the pieces organized. The L Challenge comes with 24 "different" challenges, but from what I've seen, they're not that different from each other (difficulty wise and in variety). 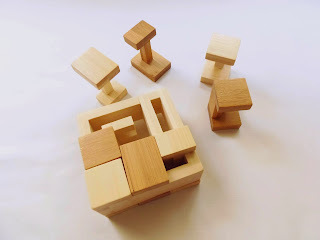 Essentially, there are five different shapes you can build with the pieces. 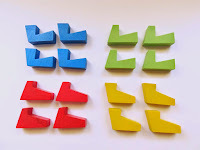 There are various solutions for each shape with distinct color combinations, but they're quite easy to solve and don't seem challenging at all. Honestly, I don't understand why it's rated as a difficulty level 10/10. I managed to solve several of the 24 challenges within 5 minutes, and the rest is just more of the same, so the variety and novelty factor wears off pretty quickly. 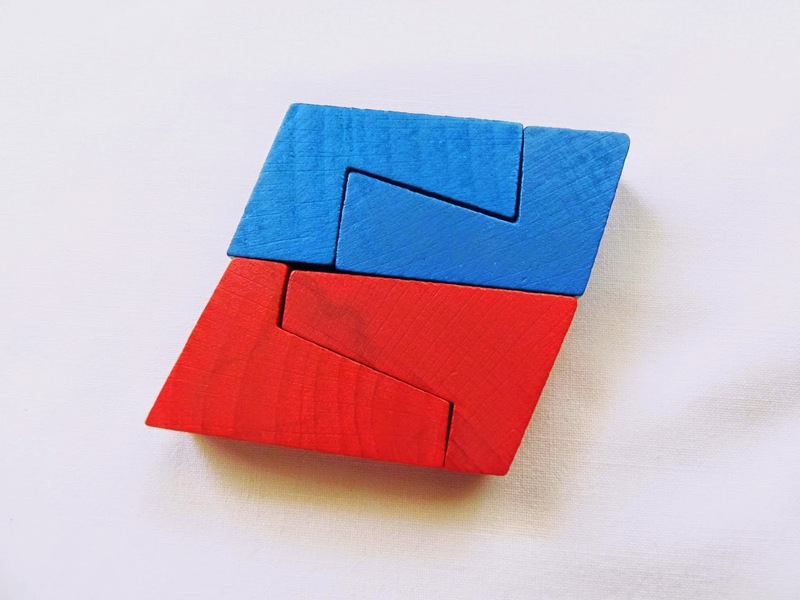 You can try to solve four shapes at a time with all 16 pieces, like the photo below. The L Challenge proved to be a bit of a disappointment. Yes, it looks cool with all the colorful pieces, but it leaves an underwhelming feeling for a packing puzzle fan like me. The challenges can be an incentive to keep playing, but bear in mind that they won't get harder as you try to solve them all. 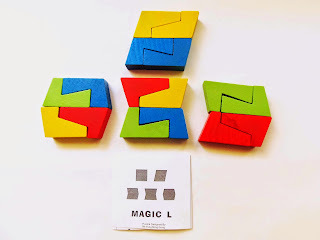 Availability: You can get a copy of The L Challenge at PuzzleMaster for about $11 CAD. The others in the IQ Fit series are also available. 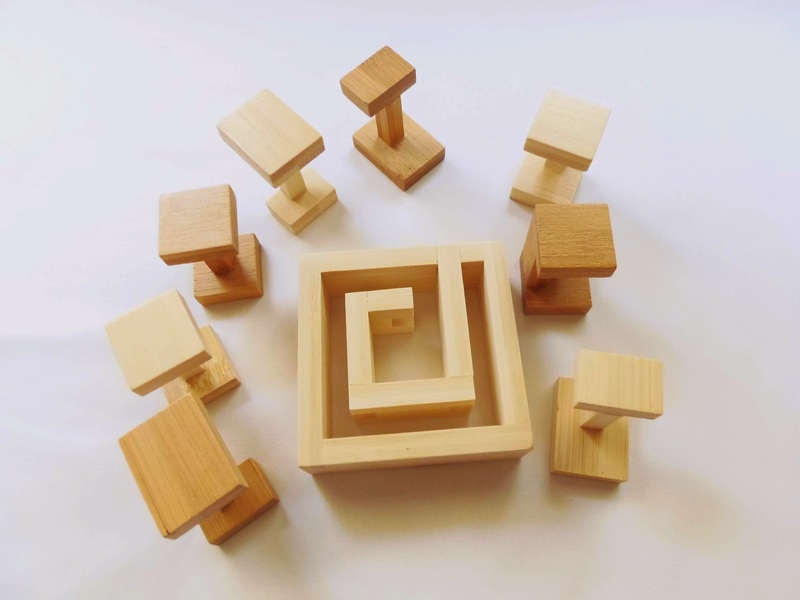 Funzzle is a collection of interlocking puzzles made of bamboo and designed by Y. Gong. Each puzzle is regarded as extremely challenging, but you should half expect this for most of interlocking puzzles...At least, that's what I've been experiencing for years. In fairness, Mr Y.Gong didn't come up with the Kappa design. The original (Noncsi) is made by Tamás Vanyó, as Mr Gong only made a couple of modifications to avoid it being an exact copy of Tamás' design. It's not a very honest practice, in my opinion, but I hope the original designer is ok with it. Bamboo puzzles have a completely different feel from their hardwood counterparts. For one, they are much lighter in weight, since bamboo is less dense, but their appearance is a little different as well, due to the lighter color shades of bamboo. It all comes down to preference, or as I'd like to call it, diversity in one's collection. I like to have a mixed bag of different materials in my collection. 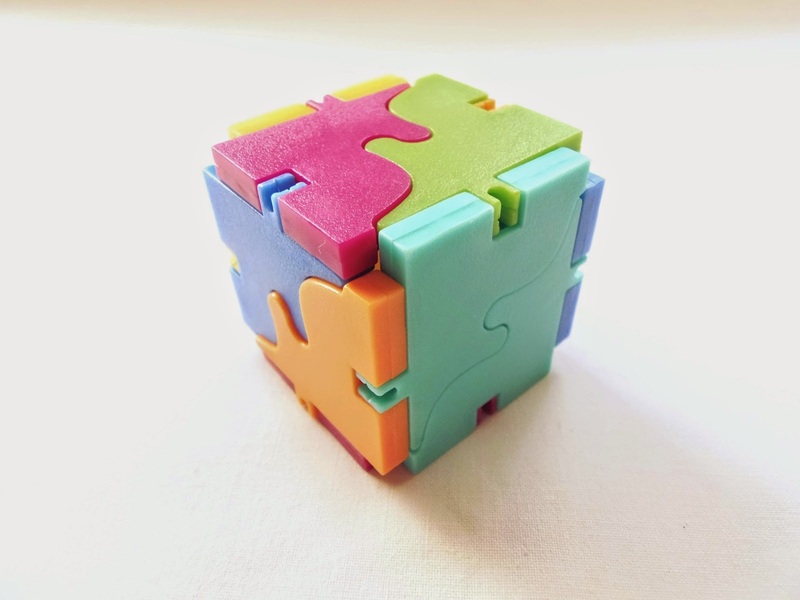 Any good interlocking puzzle has it's internal mechanism cleverly hidden and even the first piece is tricky to remove or to find out which piece really is the first one to remove. It should be a nice balance between clever design and difficulty. Well, such is not the case in this Kappa puzzle. The first piece to be removed is clearly visible miles away and it can be removed in one simple move. For reference, the original design by Tamás needs two moves to release the first piece. What does this mean in terms of difficulty, you might be wondering? A lot, since it makes the puzzle much less challenging than it should be. The eight pieces slide along a square frame, in sequence, and they can only be removed one at a time. As you remove piece by piece, you must constantly slide the pieces back and forth to make room for the next piece in line to be released. The reassembly didn't much time or was it that challenging, but only because I didn't shuffle the pieces and had them placed in the correct sequence out of the frame. If you like a real challenge you can mix the pieces once removed from the frame and try to figure out which pieces should go first and which ones should go last. I ended up with mixed feelings about the Kappa puzzle. 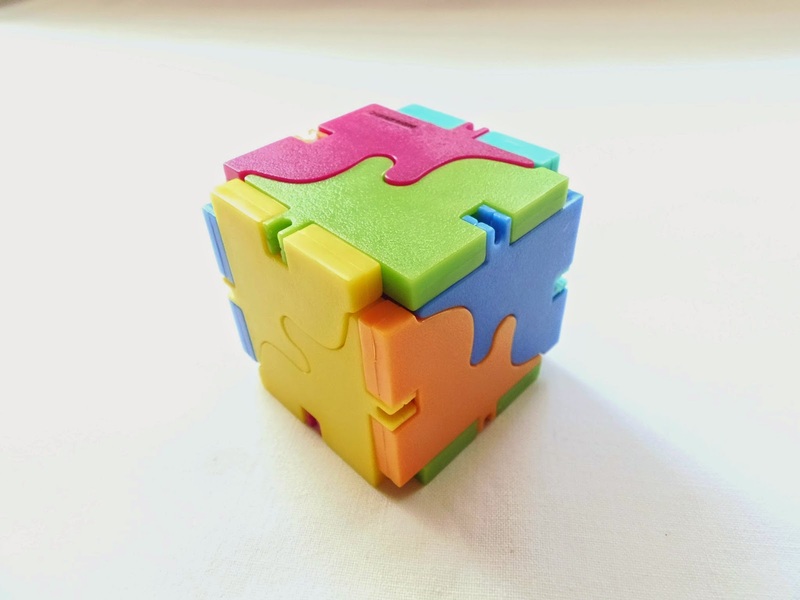 On the outside, it looks great with an unusual design for an interlocking puzzle, but the execution of the idea leaves a lot to be desired, since it's a cheap copy of the original and it doesn't even work as it was meant to be. I still have a couple of the Funzzle puzzles to review, but judging by the quality of the first one, I don't expect much from the others. 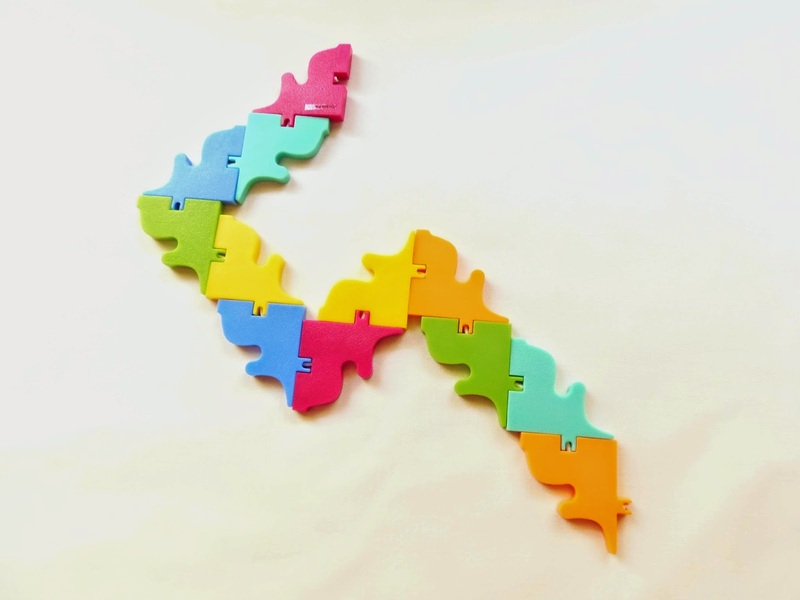 Availability: The Kappa puzzle and all the others in the Funzzle series can be purchased at PuzzleMaster. 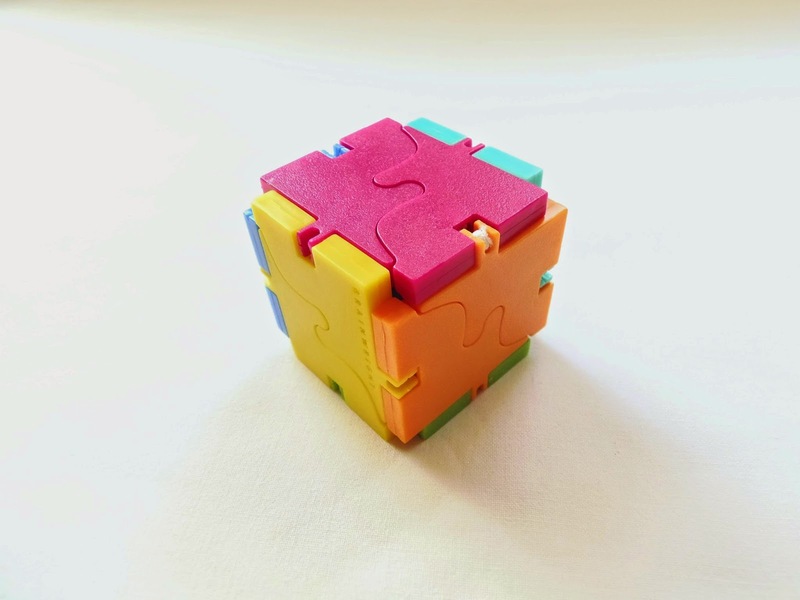 George Miller is best known in the puzzle community as a puzzle prototyper, helping designers to transform their ideas into something real and palpable. However, he doesn't just make other people's ideas come true, he also does this for himself with his own designs and he's pretty good at it. One of such puzzles is the Flexi Cube, a versatile puzzle with six different challenges made by Brainwright. 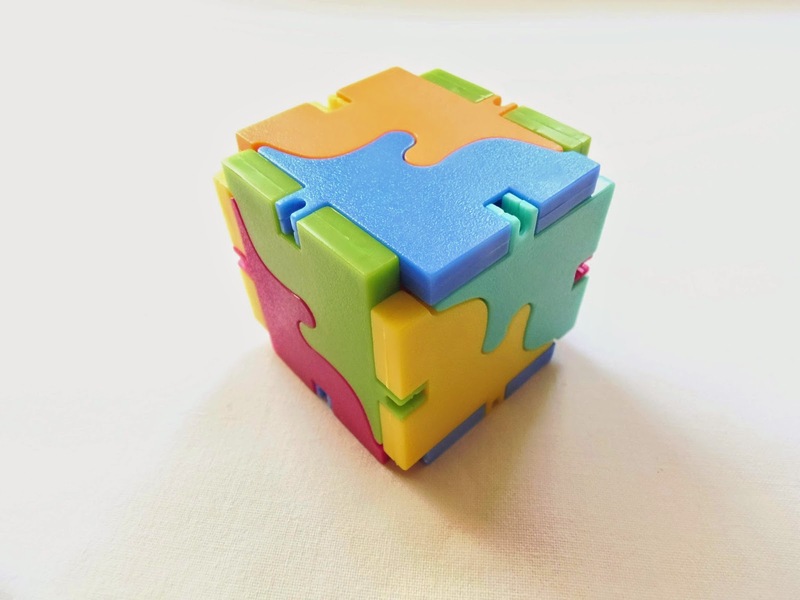 What I really liked about the design of the Flexi Cube was its bright colors and the unusual shape of the pieces. 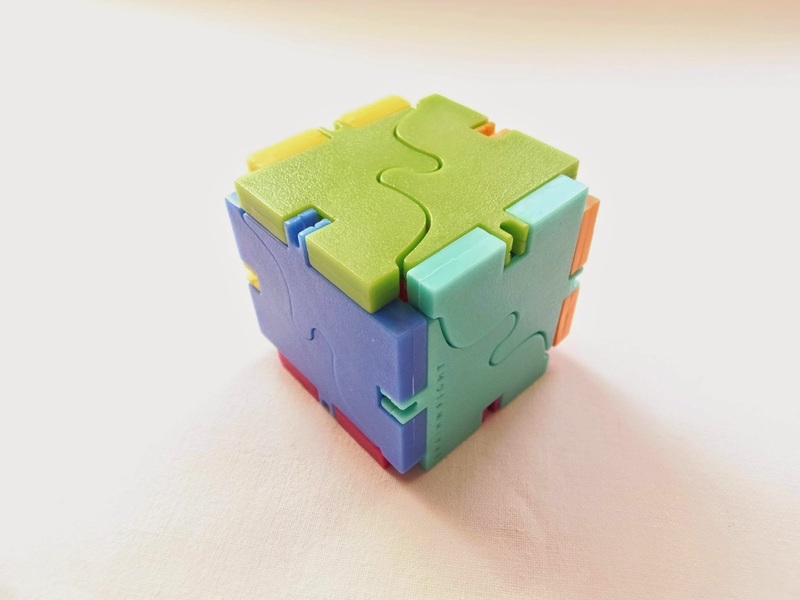 The ability to build the cube into different color patterns is a very welcome bonus for those of you that are not satisfied with just one solution - Mind you, there's only one solution for each of the six challenges. The Flexi Cube basically works like the classic Elastic Cube (seen here from my collection). Each of the 12 pieces is connected to two others by an elastic string, allowing you to bend them in any direction. When solving one of the challenges, two pieces can be joined together to form one of the six faces of a cube, much like a jigsaw puzzle. The idea is to turn the flat pieces (2D) into a cube (3D). The cube is small, about 4.7cm in diameter (1.85"). The pieces are made of thick and durable plastic and the string is of very good quality - won't break unless you really stretch it to ridiculous lengths. 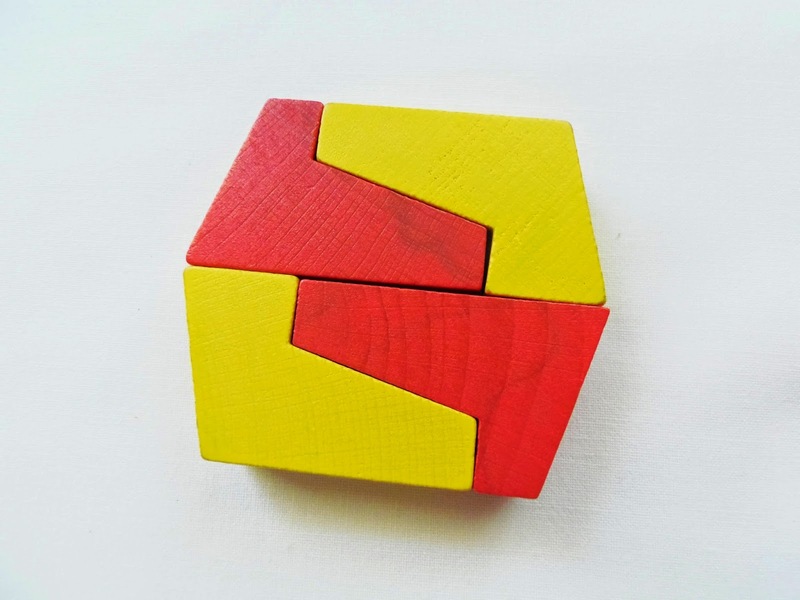 When a cube is made it will hold together quite firmly until you disassemble it again. I didn't solve all six challenges, but was able to make three of them in a relative short time (10 minutes). Overall, I didn't find it very difficult. The challenge that was probably harder to make was the one that asks you to get each side of the cube with different colors. I'm just not sure if my interpretation of "all sides different" is the same as them, because what I ended up with was each side with two different colors, but opposite sides have the same color combination. Now, if that's not the solution, then I guess I found a seventh challenge, since it doesn't match any of the others. The easiest challenge might be getting one single color on each side (there are six different colors). 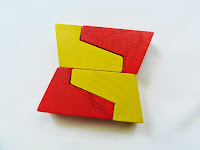 Here, you just need to find a way to join two pieces of the same color together and then work your way until you have all six sides with a solid color. 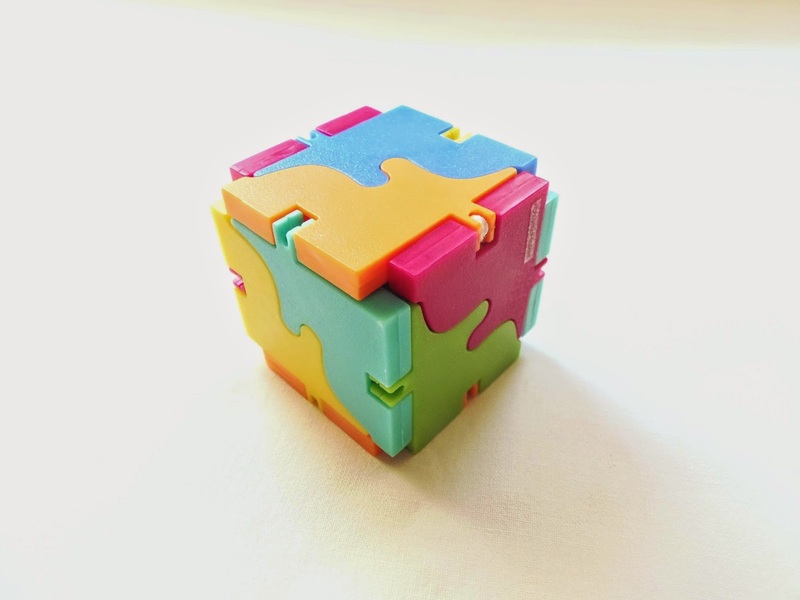 The third challenge I solved was more like a random solve, ending up with four different sides and two of the same color. (Click to Enlarge) - Challenge "All Sides Same"
Even though I didn't find the puzzle that much challenging, I honestly thought it was really fun to play with. I like how the pieces fit together with their curved inside shapes, and the possibility of multiple solutions is an added incentive to keep playing for a bit longer. 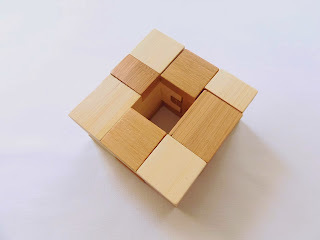 By being a simple design devoid of any complexity, anyone with a curious mind can easily pick it up and try to solve any of its six challenges. 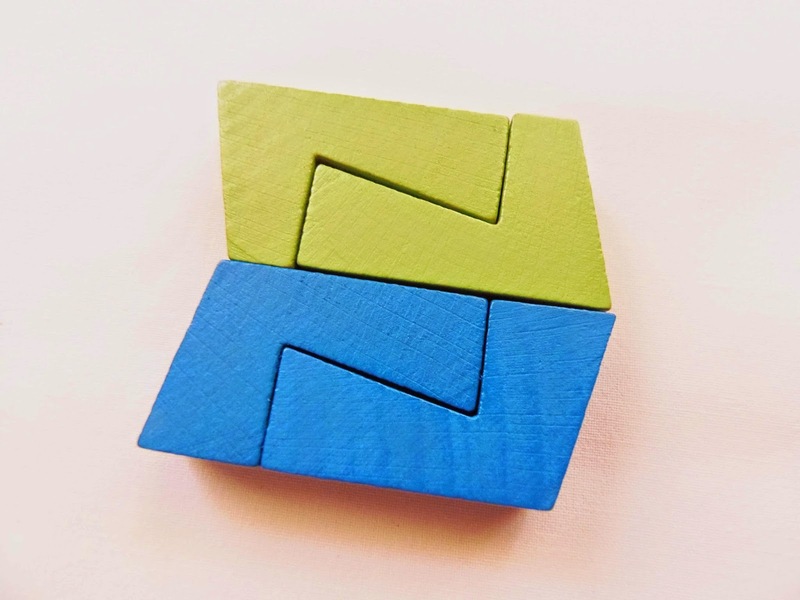 You can also fold it into other shapes other than the cube - Thanks for the tip, Pantazis! 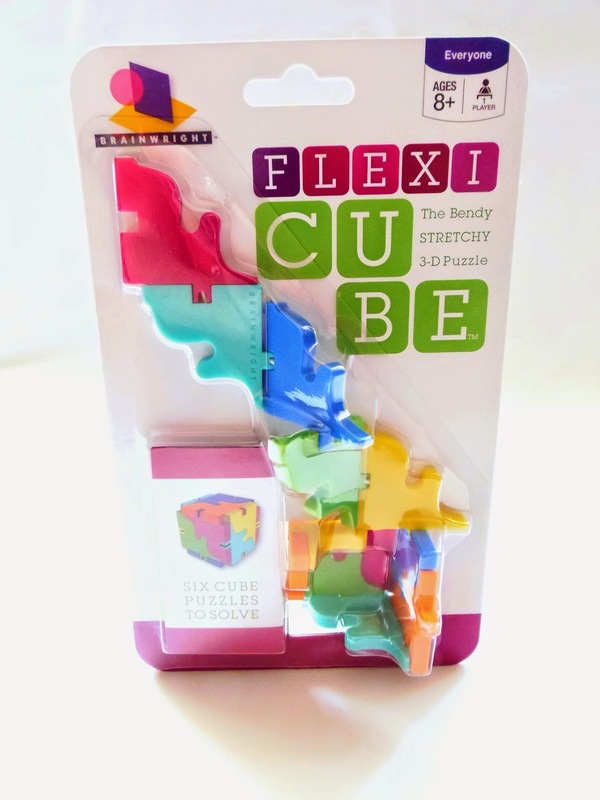 Availability: The Flexi Cube is available at your favorite Canadian puzzle store, PuzzleMaster. 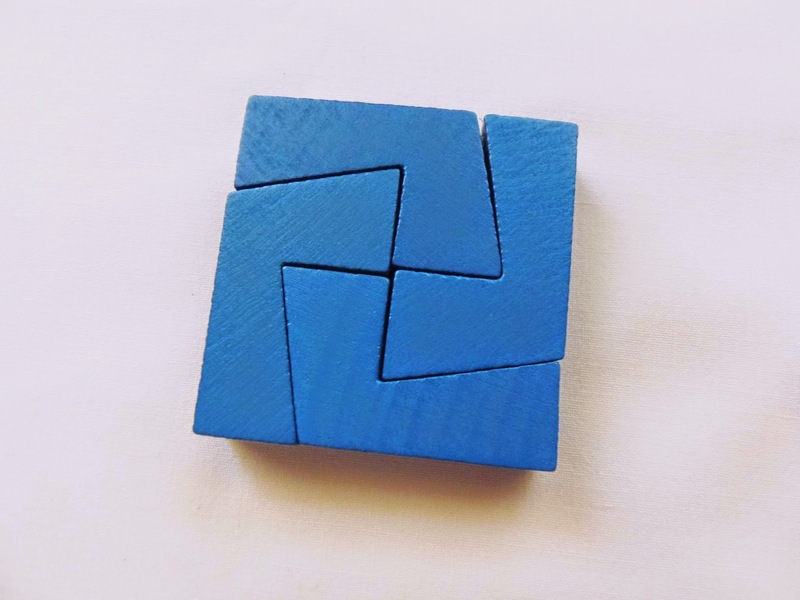 Check out more cool puzzles by Brainwright. (Click to Enlarge) - Challenge "All Sides Different"
(Click to Enlarge) - Challenge "4 Sides Different 2 Sides Same"
The build quality of this lock is very similar to the first one: sturdy, made with solid metal parts, quite heavy and works exactly as it should - well, not exactly as you'd expect, but that's a given when it comes to a trick lock. Always deceptive, but quality is very good. 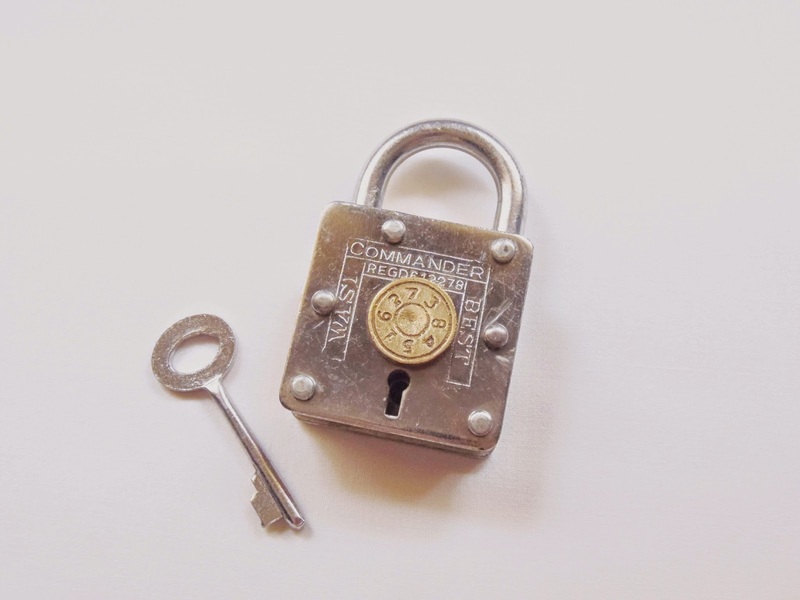 The size of the lock is roughly 4.8cm in diameter (about 1.9"). 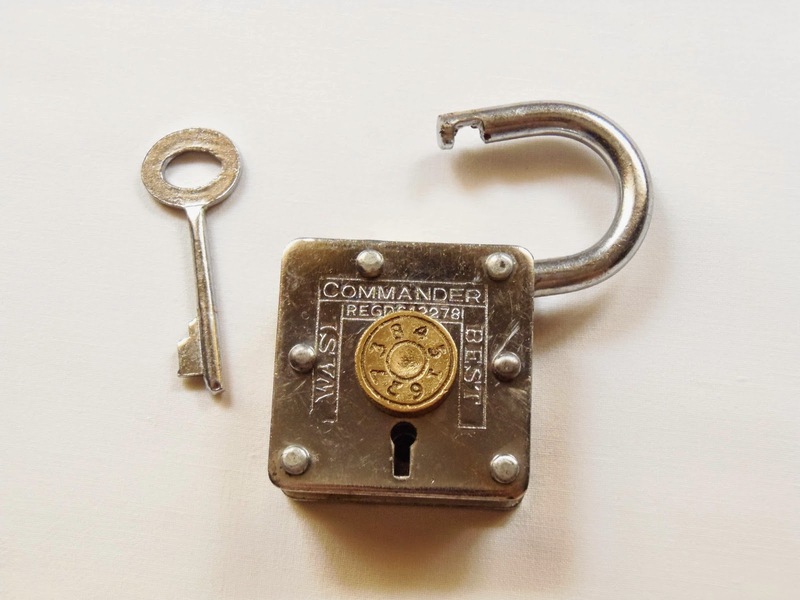 The look of the puzzle is identical to any other ordinary padlock, but the similarities are merely aesthetic. Look closer, and you'll find it's much more than a simple lock and key. The main feature of the puzzle is a rotating disc with eight numbers engraved on it. The numbers have an alternating pattern, which may or may not have something to do with the solution. The provided key fits on the keyhole, but it doesn't seem to produce any effect, whether you turn it left or right. Like any good puzzle lock, there's a couple of clever red herrings that will try to get you off track. Is the solution finding the correct sequence of the disc? Or is it trying to make the key work? Is the key even necessary? Are there any hidden clues? All these questions and more will pass through your head during your solving process, but that's part of the fun, isn't it? The difficulty of the Under Lock and Key is a tad more challenging than the Dead Lock, but if you keep at it, you'll eventually discover its secret. It has that a-ha moment when you finally get it. I've seen many different mechanisms on trick locks and this one was new to me, which is always welcome in any puzzle. Puzzle locks are always a good choice to trick family members and friends. They're an excellent source of entertainment in any social gathering, but also an object of admiration and fascination for its clever tricks and ingenious mechanisms. The Under Lock and Key from the Houdini Series is a very nice puzzle at an affordable price. Availability: You can get the Under Lock and Key puzzle at Brilliant Puzzles for $19.95 USD. The others in the series are also available.